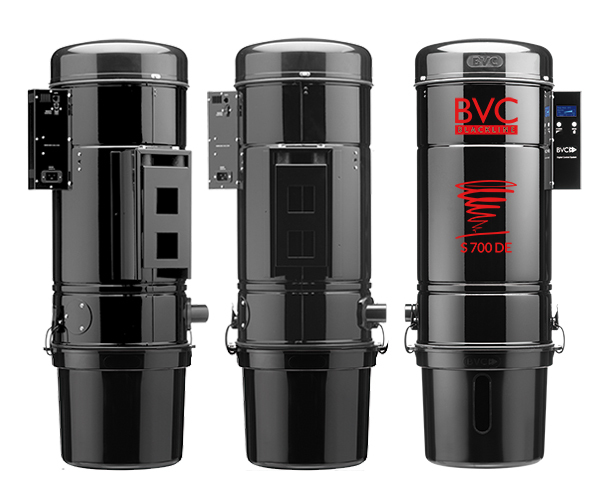 BVC central vacuum cleaner in detail - Information about construction, analog and digital control electronics and Three-Filter-System. BVC central vacuum celaners SILVERLINE S-range with analog control system. The extremely stable housing of the BVC central vacuum cleaners is made of electrolytic galvanised steel, which is than powder-coated. The vacuum is mounted on the wall and directly connected to the piping system. The robust wall mounting of the S-series is equipped with two sound-absorbing rubber blocks. Due to the special construction of our vacuum and the Though-Flow-Technology of our turbines our machines are rather quiet. The soft-start of the motor prevents the motor from running at full power when the vacuum is turned on. Less Wear and tear and less vibrations when starting are the results. With the operation hour counter you can control your maintenance intervalls. Hose handle start: this depends on the type of vacuum hose you have. We offer hoses that have ON-/OFF switches or valuable speed switches. Vacuum inlet start: by inserting the standard hose in the inlet valve the vacuum starts. ON-/OFF switch on the vacuum. BVC central vacuum cleaners BLACKLINE S-range with digital control system. Models with digital control system offer you more comfort and safety. The menu in the digital electronic box has five different functions which can easily controlled with two buttons. The display shows, depending on the menu you choose, different views. Beginning from the initial commissioning the display provides you with information at the push of a button. Thanks to the three-filter-system the exhaust air can be filtered up to almost 100 percent. 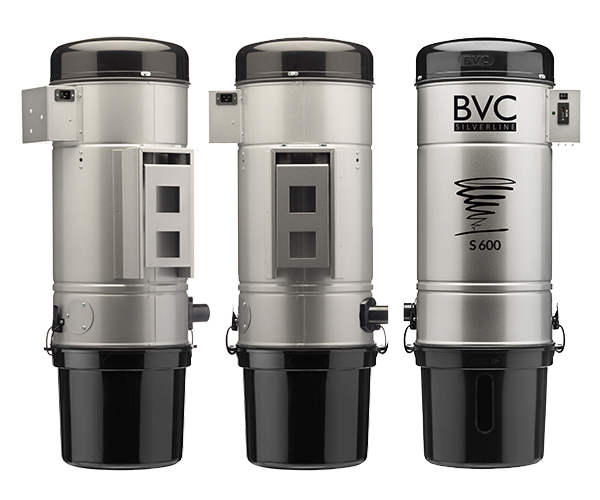 BVC guarantees with this highly modern filter technology maximum hygiene and best protection against house dust allergies and asthmatic illnesses. The motor generates a vacuum, which pulls the motor protection filter upward. The filter prevents dust particles from entering the engine compartment and filters the exhaust air. After use the motor protection filter falls back into starting position. 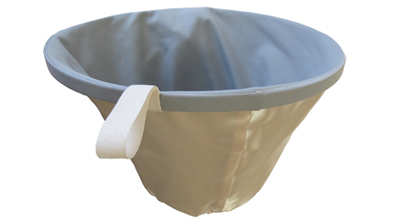 The filter bag is crucial for a hygienic and comfortable dust disposal. 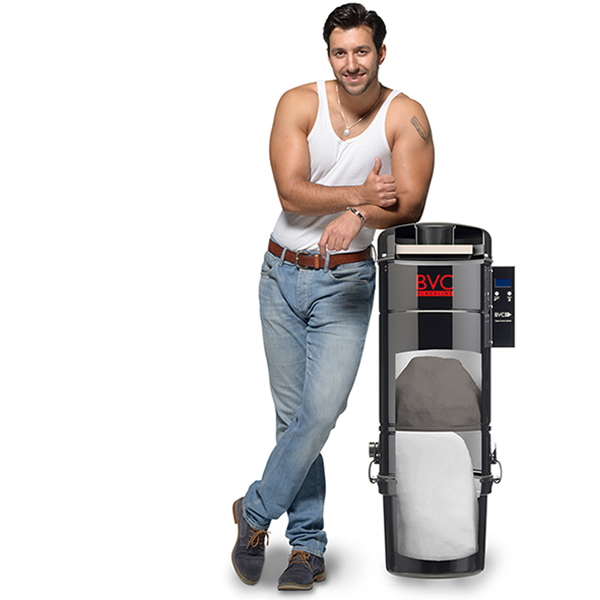 The filter bag has a volume capacity of 16 liters. The new two layer motor protection filter consists of a CORDURA® fibre on the inside, which stops fine dust particles from entering the motor compartment. Our satin fabric on the outside has a smooth surface, dirt simply falls off and is collected in the dust container. There is a weighted center of the CORDURA® filter. When vacuuming the filter is pulled up by the underpressure. Due to the weighted center the filter falls back into the dust container after the operation. Dust particles fall off into the dust container. In operation: The generated vacuum pulls up the CORDURA® motor protection filter into the direction of the motor. Turned off: The CORDURA® motor protection filter falls down to its original position and shakes off the dust. Vacuuming with or without filterbag? You decide! If you are thinking about buying a new vacuum cleaner, the question is whether you should buy a machine with or without filter bag. With the BVC BLACKLINE and CORDURA® motor protection filter you can change your decision after the purchase. If the bagless method does not suite for you, you can easily insert a filter bag. Hygiene: One disadvantage of the bagless vacuum cleaning method appears when emptying the dust container. Dust swirls up and will be inhaled by the person who takes out the garbage. Especially house dust allergy sufferers should use a filter bag. Filter bags can be changed easily and dust free. Comfort: Filter care applies regardless of the central vacuum unit. Every now and then the motor protection filter has to be cleaned or changed. The bagless unit demands for additional care. Dust and dirt sticks to the container, so it needs to be cleaned periodically. Costs: With the bagless method you don´t need to buy new filter bags. This is the more cost-effective solution. Environmental aspects: The bagless version does not make use of resources and does not produce waste.